"I want to be on the land my ancestors dug into, pulled from, rose up from - and fell into. I want to be on this land, listening, and I also want to let the land be." NIICUGNI ― THE WORD ― IS A DIRECTIVE TO PAY ATTENTION, TO LISTEN. Niicugni the dance quietly compels such attentiveness through its layering of multiple dances, live music, stories, and histories. Housed within a light/sound installation of hand-made, functional fish-skin lanterns, Niicugni asks – can we pay attention to the ways we do and do not listen to our bodies, histories, impulses and environments? Equating the molecules of land with the cells that comprise our bodies, Niicugni is also about how land, or place, like our bodies, is a repository of past, present, and future. It holds, at once, myth and truth, magic and evil, hope and death, laughter and monsters, as well as ancestral histories and cultural identities. In the moment of each performance, Niicugni wonders if we can recognize the importance of everyone in the room? Can we see ourselves as part of the whole? Can we absorb that everyone we see is here now and will be gone? Spurred by these questions, Niicugni provides two distinct dances layered into each other: one performed by the company, the other by local community participants reflecting the audience back to itself at regular intervals throughout the performance. Farmers, Librarians, Dance students, Beekeepers, Architects, Skateboarders, Mothers with Young Children, Weavers, a Rollerderby team - a different set of participants from each performance community. Thank you to all who have joined us! Niicugni is a National Performance Network (NPN) Creation Fund Project co-commissioned by PS122 in partnership with MANCC, Portland Institute of Contemporary Art, Tigertail, Northrop Concerts and Lectures at the University of Minnesota, and NPN. Major contributors of NPN are the Doris Duke Charitable Foundation, Ford Foundation, Nathan Cummings Foundation, MetLife Foundation and the National Endowment for the Arts (a federal agency). For more information: www.npnweb.org. 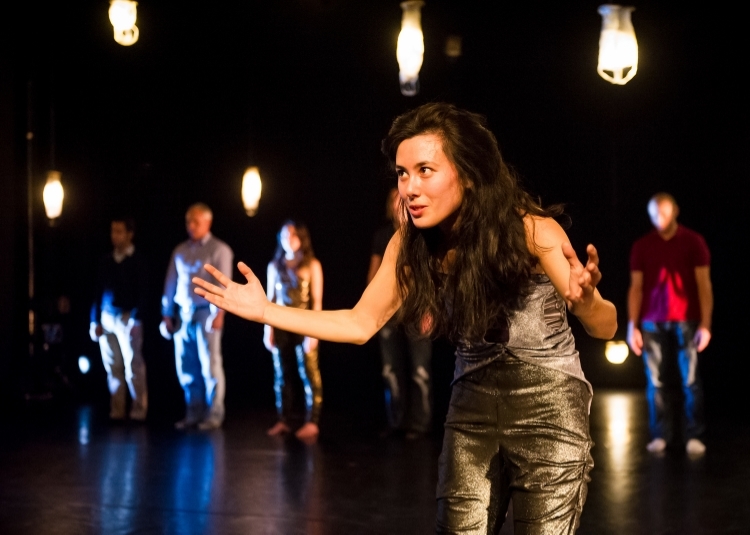 Niicugni has been supported through residencies at Vermont Performance Lab with support from the Dance To Go Fund from the McKnight Foundation, MassMoca, The Arts Collaboration Lab with support from PS122 and Columbia University, Arizona State University, and the Headlands Center for the Arts. Community Connections Fund of theMedLife Foundation. General Operating support was made possible by the New England Foundation for the Arts with funding from the Doris Duke Charitable Foundation. Production residency for this work was supported by the National Dance Project of the New England Foundation for the Arts, with funding from The Andrew W. Mellon Foundation. Niicugni is underwritten by the American Composers Forum's Live Music for Dance Minnesota program in partnership with the American Music Center, with funds provided by the McKnight Foundation and the Andrew W. Mellon Foundation; and is funded by the National Native Artist Exchange, a program of the New England Foundation for the Arts, made possible with funding from the Ford Foundation, the Native Arts and Cultures Foundation, and Anonymous donors.